After completing my recent analysis of WMATA’s Metrorail fare increase, I decided to do some more research to better put the fares in a national context, finding D.C. Metro riders pay some of the highest subway fares in the nation. 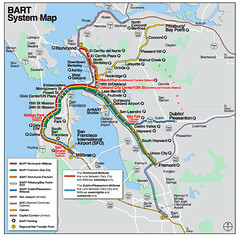 I then did a side-by-side comparison with San Francisco’s BART, considered a sister system to the D.C. Metro. The analysis of BART fares from a downtown San Francisco station shows that Bay-area suburban commuters enjoy even cheaper per-mile fares than their D.C. counterparts. With the D.C. Metrorail’s fares set to increase on Sunday, it piqued my interest in precisely how the system determines charges and the nature of the changes. I decided to take a look at exactly what pattern the famously unpredictable fares took. While most news reports have reported suburban riders would experience the largest absolute increases, my analysis shows they continue to enjoying the lowest cost per mile of all riders, well below the cost of automobile use.